no la.. changed from white sash to black sash quite sometime back liao..
i heard from AIG staff that they will change their branding in July. Maybe the AIG logo may no longer be in the new jersey? (06-24-2009, 11:22 AM)Omega74 Wrote: i heard from AIG staff that they will change their branding in July. Maybe the AIG logo may no longer be in the new jersey? then better grab the AIG edition! Like the 06/07 Vodafone edition. for the start there will still be AIG cos Nike printed the jerseys already as what was reported before. If they were to change it, most probably will be on the second half of the season. Which i think is unlikely to happen. This will be their last tie up and changing it for what little time is left isn't gonna do much difference. I think AIG contract is still in effective but I dont know the cut off date..nothing to do with they already printed or whatsoever. AIG decided to continue to be the on the shirt because Nike had already printed the shirts much earlier than when the AON deal was struck. If it was dealed much earlier, like lets say december last year then most probably AON will on our shirt for this coming season. Relieving AIG of the much needed money for their own "good" use. These contract always have a get-out clause thing. With AON replacing AIG, United have nothing to lose but Nike had it their way and continued to print AIG because they just couldn't afford to have wait for United to struck a deal with a lucrative sponsor. There is just not enough time to get all these shirts ready by the time. These shirts sells in millions, not a small number. Plus their factory not only makes United shirts, but mostly all of the Nike sponsored teams. Troubled U.S. insurer AIG will end its shirt sponsorship deal with Premier League and European champions Manchester United next year. End of era: AIG will not renew its four-year sponsorship deal with Manchester United. It was widely believed that AIG would not renew their £19 million ($27 million) per year shirt deal when the four-year contract expired in 2010, due to the financial troubles the company has suffered. And, on Wednesday, the company confirmed this. 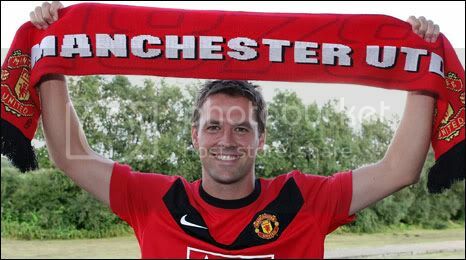 "AIG's shirt sponsorship with Manchester United runs through May 2010. We have no plans to renew the deal," said a company statement. AIG is still restructuring after receiving a bail-out of $150 billion from the U.S. Government. They also have a £5 million ($6.8 million) per year deal to run MU Finance, but it is not clear what will happen with that contract. Despite the loss of AIG, a Manchester United spokesman told the UK Press Association that the Premier League giants hoped to better the current deal it had with the U.S. insurer. I tot if the collar is v-necked, it will look much better.. Round-necked looks really weird to me..
Once a "RedDevil", Always a "RedDevil"
ya, more like ringer tee. The material doesn't look that great either. Most probably is the same as the current blue 3rd kit. Much prefer the material from the home one. Current time: 04-20-2019, 02:53 AM Powered By MyBB, © 2002-2019 MyBB Group.